Webinar series is currently planned to be held on Sundays around 6pm UK time. All are welcome. Unfortunately only an audience of 50 can attend. 2 speakers from the community and Rob will talk. The webinar will be used to try out the technology. The webinar will be recorded for public viewing afterwards. 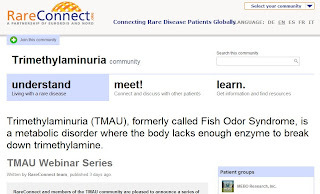 RareConnect and members of the TMAU community are pleased to announce a series of webinars from experts/researchers of Trimethylaminuria (TMAU) and the Flavin-containing mono-oxygenase 3 enzyme, to be hosted on Sundays, beginning on Sunday August 19th at 6pm GMT (UK time), with a presentation from members of the TMAU community and Rob Pleticha, Online Communities Manager at EURORDIS presenting the TMAU Community. The webinars will be recorded and archived for viewing at anytime. The first webinar will have guest speakers from members of the TMAU community, along with Rob from EURORDIS who is hosting the webinar. Cheryl Fields : Long-time friend and helper of the TMAU community. Will provide a talk : “Having The Power To Endure: Obtaining & Retaining Employment With TMAU"
The platform for the webinars is Adobe Connect. This means you need flashplayer installed, which is very likely already done if you can view YouTube videos. All slides will be viewable in the webinar meeting room and all audio will be from the computer. Meaning you need speakers or headphones working properly to hear the presenters. If you would like to ask a question or make a comment, you may do so by your computer’s microphone or through a text chat box. Note : The capacity of the webinar system is limited to 50 attendees. Please enter the webinar room early to ensure your space. A partnership project of EURORDIS and NORD, RareConnect provides a platform for rare disease patient organisations to develop online communities across continents and languages. RareConnect provides a place where patients and families, researchers, physicians, and representatives from patient organisations, can connect in a neutral, non-commercial space. Translation of stories, blog, and forum posts are completed by human translators. Patients can therefore have conversations with others in languages they do not even speak themselves. See a video of living with TMAU, subtitled into 5 languages here. The TMAU Community was launched in partnership with MEBO Research in May 2012. Please register and share your experience there today. Where can we submit questions in advance ?